Come for the entire event, or come and go as you wish (see the schedule below for this year’s selections). Delicious homemade food will be available for minimal cost. These refreshments will be served and consumed in the church’s parish hall, where the concert is piped in so that patrons can grab a bite to eat without missing any of the music. 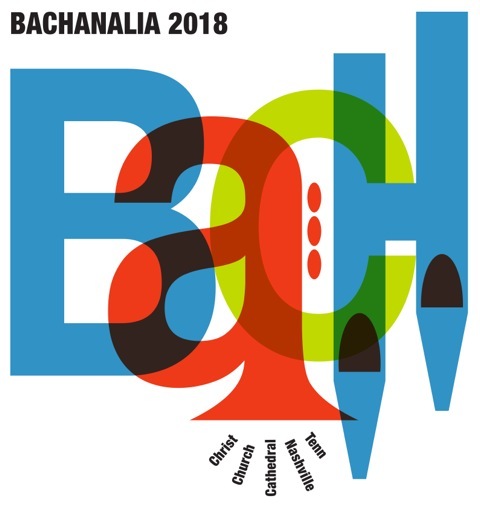 As in years past, BACHanalia 2018 t-shirts will be available for sale, featuring this year’s logo (above). The music is presented continuously, alternating between two performance spaces: the chancel and the choir loft, so there is no “dead” time between sets. It is one long, glorious, eclectic, paean of devotion to Sebastian’s music, and there is no other event like it in Nashville. We will also hear many, many movements from a broad selection of larger works. Unusual instrumental combinations include harp ensemble (and harp soloists), bassoon quintet, saxophone quartet, and jazz combo. Notable historical transcriptions that will be performed include Ferruccio Busoni’s 1893 transcription of the D minor Chaconne for solo piano, and the Adagio from the C Major organ toccata transcribed by Alexander Siloti and Pablo Casals for cello & piano in the 1920s. There is also an unusual transcription of the Allegro Moderato from the E flat flute sonata for tuba & piano! Musicians and ensembles participating this year include members of the Nashville Symphony, the Nashville Philharmonic Orchestra, Parthenon Chamber Orchestra, the “Bach Double” Orchestra (Suzuki students), Portara Ensemble & Nashville Concerto Orchestra, Vocal Arts Nashville, Avila Soul, Bassoonery, Nashville Saxophone Quartet, Harpistry; faculty from local universities, organists from area churches, and many other members of the Nashville musical community. This year will mark my sixth and seventh performances at this annual event: I’m slated to play recorder on Cantata BWV 39 with Portara & the Nashville Concerto Orchestra, and I will also perform the Italian Concerto on solo piano. I am very much looking forward to these experiences. 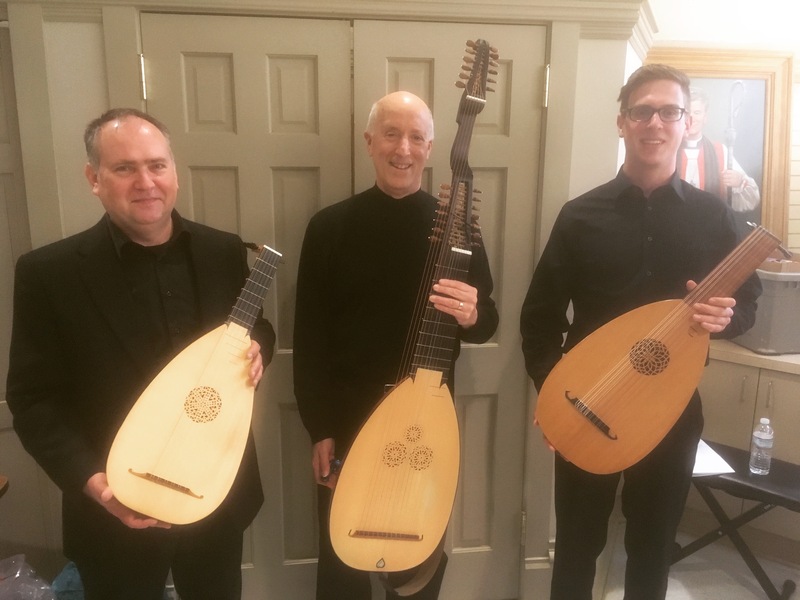 Last year I played treble lute in a lute trio on two beautiful arrangements of chorale preludes transcribed by my colleague and fellow lutenist Francis Perry (we both studied with the same teacher, the late, great Patrick O’Brien). In one of Francis’s arrangements my part had for a number of measures a series of half notes soaring above the busy passagework the other two lutenists were playing. Confident enough in my ability to play this section well without reading my part, I glanced up from the music on my stand to look at the audience, and realized why I love performing at BACHanalia so much. The audience was listening with a rapt and devotional attention that gave back to us support, affection, and a shared love of Sebastian’s deep and renewing genius. For me, that moment expressed the essence of why this event is so special. Thank you so much to the musicians of Nashville for this tremendous event, to Christ Church Cathedral for hosting it every year, and to all of the volunteers who make it possible. If you see them, please take a moment to express your gratitude to Susan Dupont, Joel Treybig, Carolyn Treybig, and everyone else who has contributed to nurturing, organizing, and producing this unique, beloved annual event for twelve years now. We are so fortunate. Here’s a synopsis of the schedule, which is not quite complete yet and subject to change. As I learn about corrections or updates I will make them below. By walterbitner in BACHanalia, Baroque, Chamber Music, Choral, Choral Music in Nashville, Community, Early Music, Music, Our Friend Sebastian on March 2, 2018 .